$397 (approx. €350, £308) with free shipping. On the way to the top of the hill you ended up with a good drenching. The big rain cloud unloaded once it reached land. Soggy, you carry on past the houses to the left and right. This is the road that takes you out along the coast. On the crest of the hill, a breathtaking vista is before you. The coast and headlands stretch off into the distance. Below, you can see the rocky shore and the white foam of the waves crashing onto the rocks. The sky has brightened now. The burnt gold and orange of the wet bog grasses glisten in the raking evening sun. It’s that time of day. After the rain has petered out, the sun arrives in all its splendour. Everything becomes bright and wondrous. Looking out, you notice a small island nestled in the turquoise and azur sea. To the right a white strip of light shimmers. On the horizon, dark pewter-blue, rain-soaked layers upon layers of clouds pass by. But as you lift your eyes, the clouds become filled with light with touches of cream and rose. The juxtaposition of the slowly moving clouds and static telephone polls makes them stand out in relief. They lead your eye down the hill and onward across the squelchy chocolate-coloured bog until you reach the brow of another hill, and another wonderful vista opens up before you. We absolutely love this one John! 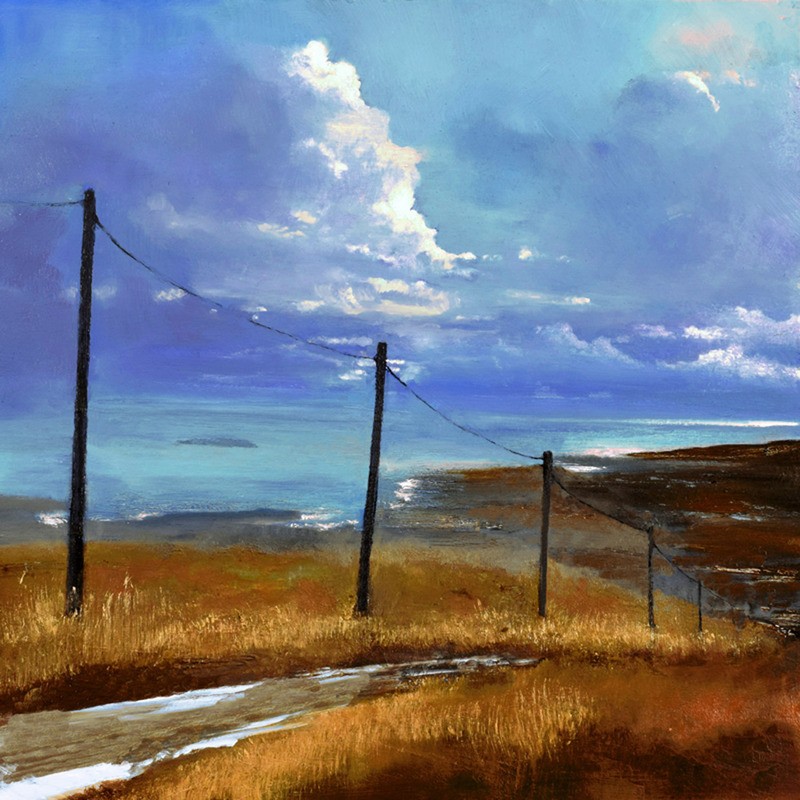 In fact we have enjoyed the whole series of The Road to the Sea and this one incorporates what you paint so well – the texture and colour of a boggy landscape; a wondrous sky and an open vista with the sea and a tantalising view of a remote island but the touch of human hands in the form of the telegraph poles remind us of our place in the world. 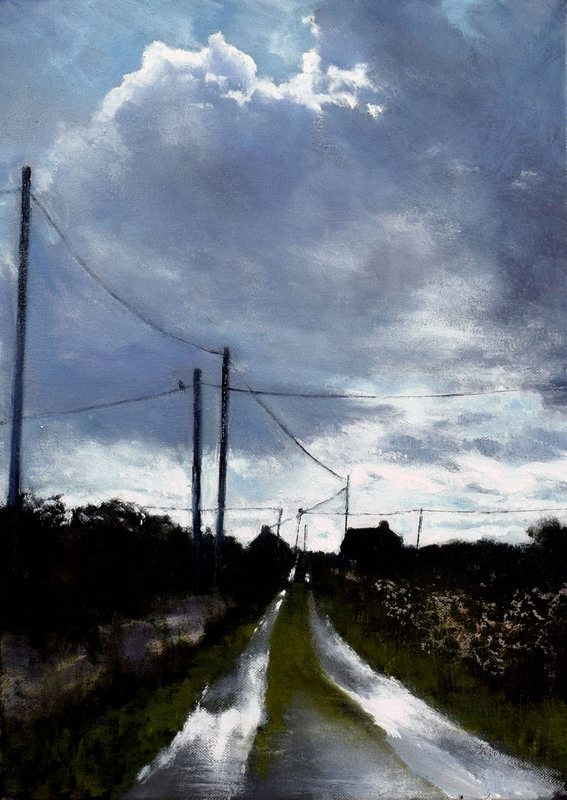 Thank you Chris, that’s great to hear that this one is a particular favourite, with all the ingredients that I return to time and again, sky, bog, grasses, with the addition of the telephone poles stark and immovable.